Owned by the Fugazza family, Castello di Luzzano is an estate located in Rovescala, a commune in the Province of Pavia, located about 50 km southeast of Milan and about 25 km southeast of Pavia, in the Oltrepò Pavese, in the Italian region of Lombardy. Lombardy (or Lombardia) is one of the 20 main regions of Italy, which represents the central northern part of Italy, squeezed between Piedmont to the west, Austria to the North, Trentino – Alto-Adige to the east, and Emilia-Romagna to the south. The capital is Milan. Producing dark, earthy and slightly tannic wines, Bonarda is a red grape variety known as “Corbeau” or “Douce Noir” in the Savoie in France, where it is supposed to have originated from. Yet, it is also a name applied to several different grape varieties used to make red wine predominately in northern Italy and other parts of the world. It grows under the name of “Charbono” in California. It is now wildly planted in Argentina where it benefits from ideal growing condition and produces great everyday red wines that can easily rival some Malbec. Finding its ground of predilection in Italy, it bears the name of “Dolce Nero” and more specifically “Bonarda Piedmontese” in Piedmont, where it is usually labeled with the name of the main town or the region it comes from (i.e. Bonarda di Gattinara or Bonarda del Monferrato); yet in Lombardy, around Pavia, the locals call it “Croatina”, but it is more often labeled as “Bonarda dell’ Oltrepò Pavese”. Consequently, Bonarda is the most noted, most prestigious variety of the area, and is grown almost exclusively around the town of Rovescala. Nestled at about 300 meters above sea level, on the foothills that rise from the Po Valley between Piacenza and Pavia, Castello di Luzzano consists of a small hilltop ancient town surrounded by vineyards. The village is made up of the Castle of Roman origin, houses dating back to 600AD and a beautiful neo-classical church. The renovation project began in the '80s, with the intention of renovating each building to its original splendor, which would give a needed renaissance to this old village and bring back the effervescence that existed when many families lived there and the village was full of life. With the concept of ecotourism and vititourism in mind, the intent was to restore and transform the peasants’ homes into apartments for guests, to provide an environment where they could breathe history, art and the culture of wine. Giovanella, one of two owners, personally took care of the project and began the work that still continue today, given the large number of existing rural buildings in the village. 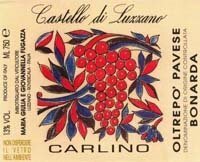 “Carlino”, which now the name of the wine produced with the Bonarda grapes from the best parcels of the estate, was from what I can understand from the following text, a person, a neighbor maybe, but surely a friend yet competitor of the Fugazza family and a winemaker that used to make a great Bonarda. There is no real explanation on the winery website, yet I think that the “Carlino” wine has been name in memory of this man and the quality of the Bonarda wine he used to produce. Stefano Testa, the winemaker, craft this wine with 100% Croatina (or Bonarda), from vines under sustainable farming, oriented southwest and planted at about 210 meters above sea level (690ft) on calcareous-marl soil. Coming from their top sights, the grapes used to produce “Carlino” are crushed, destemmed and vinified until total dryness, meaning with no residual sweetness after fermentation. The ageing process occurs only in stainless steel vat for at least twelve months to keep the freshness of the fruit. About 5,000 bottles produced per vintage. In the glass, it exposes a bright, deep dark ruby color with purple reflects. Quite intense, the nose offers aromas of nicely ripe dark fruit and berries, violet, earth and soil. The palate is really juicy, with dark, concentrated, ripe and earthy dark fruit flavors and Terroir oriented notes, with great acidity and tannic structure. The finish is dry and textured with reminiscent raw soil components. It definitely tastes “Natural”, which could slightly displease the no-organic-and-no-biodynamic-and-no-natural wine lovers, yet I found it excellent, quite complex, rich and definitely worth trying. An earthy and hearty food friendly wine that will pair ideally with charcuterie, pasta in meat-based sauces and some risottos, all pork dishes and most game and stew dishes. Thank you for your comments. Glad you found it nice and detailed.